It’s All In The Details! 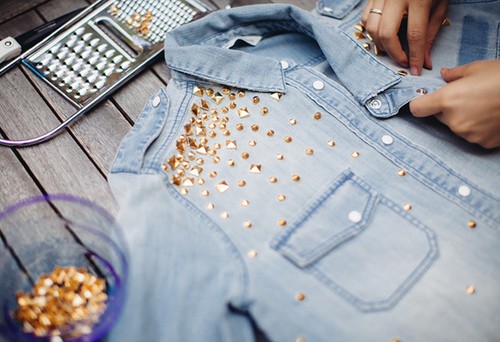 Time to Rock Those Embellished Jackets! I’ve always been one who finds joy in the small details. Especially when those small details are fashion related! I mean, let’s be honest…how many times can someone reinvent the jacket? A jacket, is a jacket. You are gonna have arm holes, some sort of front opening, and it will generally cover most of the upper body. So in order for designers to make their pieces stand out, they need to update the details…whether that be the fabric, the drape, the color, or various trims added. 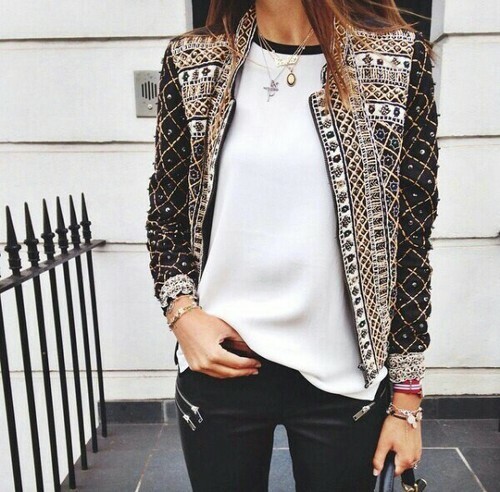 For me, I am all about embellished jackets! I love the classy look of beaded jackets with intricate patterns to punk-ified denim jackets with studs. It’s all about taking something that would be rather ordinary and jazzing it up! Check out the below pictures to see what I mean! I have a few beaded jackets in my wardrobe and I am so excited to finally start wearing them now that the weather is starting to warm up a bit. But this past winter I’ve been loving my military studded jacket that I wrote a blog post on a couple of years ago here. I swear this jacket + skinny jeans + moto boots have been my go to outfit when I am too lazy to pull a look together. I am also hoping to get do a little arts and crafts on one of my older denim jackets that I hope to do a blog post on as well. I’ve got some fun ideas in store. So I will keep you all posted!